It was a real value for money, entertaining card at the Morningside Arena in Leicester. 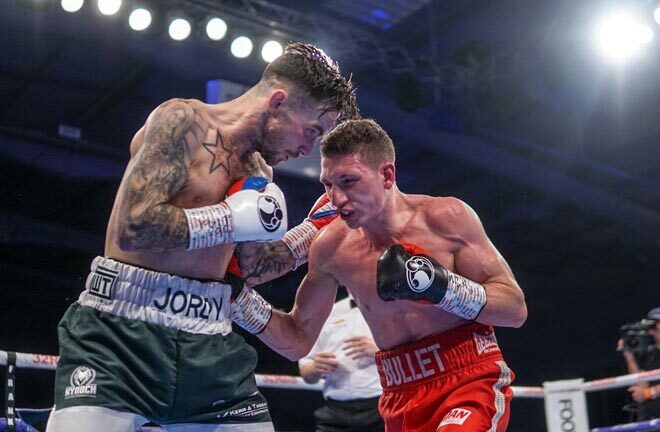 Sam “The Bullet” Bowen made a successful first defence of his British Super Featherweight Title, and sent his fans home happy, with a ninth round stoppage win over the brave Scot, Jordan McCorry on Saturday night, in an entertaining foul filled affair. Referee Marcus McDonnell was kept busy all the way through, with Bowen the first to be warned in the opener for a shot around the back of McCorry’s head. Both men struggled with the other’s style early on, but Bowen’s impressive calmness and punch picking were winning the day, and he upped the body work output in round four. McCorry was deducted a point in round six for ducking too low, trying desperately to avoid the Ibstock mans relentless body assaults. Another point was taken from McCorry in the next round, as he was pulled up for an intentional low blow as his frustrations began to mount. Bowen kept his focus, and by now Jordan’s nose was a bloody mess, and he was being busted up. Although a right hand landed flush for Cambuslang’s McCorry in the eighth, Bowen was cranking up the pressure, and in the very next round, after a vicious left to the body, a follow up assault to the head convinced McDonnell to save McCorry for another day, and Bowen retained his Title. 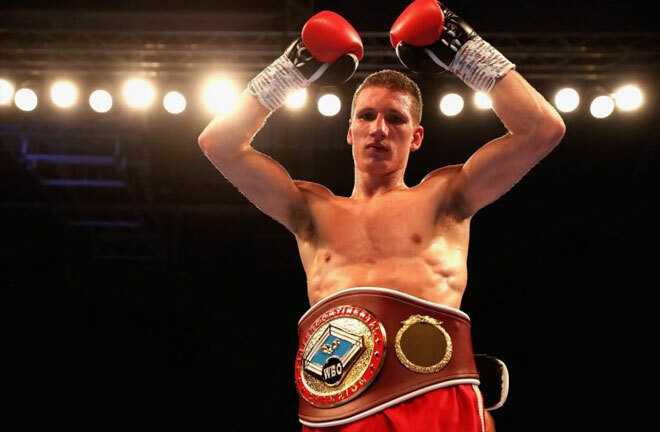 Next up could see a defence of his British crown in a local derby with Lyon Woodstock, who overcame tough Spaniard, Sergio Gonzalez, on points over eight on the off TV undercard. 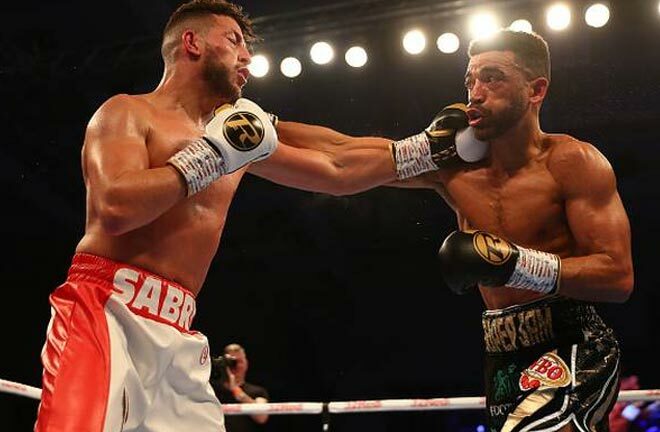 In an astonishing conclusion, Sam Maxwell snatched victory from the jaws of certain defeat, and became WBO European Super Lightweight Champion, with a last gasp knockout of Sabri Sederi. The Frenchman was drafted in at late notice this week, as a replacement for Kelvin Dotel, and although he arrived in Leicester unbeaten, he wasn’t expected to stand in Maxwell’s way. He simply didn’t read the script, and a rapid left hand, bang on the chin, dumped Maxwell on the canvas in the first, leaving him on unsteady legs. Two fainted jabs with the left, followed by a right hand again flush on the chin towards the end of the second, dropped Maxwell again, but there was insufficient time to finish the job for Sederi. The pattern was set, and Maxwell, who shared the ring as an amateur with the likes of Vasyl Lomachenko, was struggling with Sederi’s speed and accuracy. He was also shaken several times, but his best work came when he punched through the target. Maxwell was surely far behind on the cards going into the final round, and Sederi looked to put the icing on the cake. With victory almost assured, he connected with a beautiful left hand in the final minute that caused Maxwell’s legs to disobey him. Sederi mimicked this, and taunted his opponent, but this gave Sam vital recovery seconds, and Amien’s native Sederi paid the ultimate price, as with his hands down, still showboating, Maxwell took the invitation, and landed a hail Mary left-right combination with just thirteen seconds on the clock to heavily flatten Sederi. Although he bravely rose to his feet, he was in no condition to carry on, and referee Steve Gray waved the fight off. It was an unbelievable turnaround, and a real gut check for Maxwell. A rematch would be a natural, after an early domestic fight of the year contender. Nathan Gorman did what he had to do in winning every round of his Heavyweight ten rounder with perennial gatekeeper, and former World Title challenger, Kevin Johnson. At least this fight had marginally more action that Johnson’s last visit to Leicester, in a dull points loss to Daniel Dubois. Gorman worked as he pleased, and stayed patient with carefully selected shots, with Johnson yet again showing impressive defence and survival skills. He had little ambition throughout, and was intent and happy to see out the distance. The final round was arguably the highlight of the action, as the two men engaged in the dying seconds, but the result was never in doubt. A 100-90 verdict from referee Ian John Lewis was inevitable, as Gorman now hopes for a big 2019, with domestic rival Dubois on the horizon. Gorman suggested that Dubois isn’t the only option available, and they may end up taking different paths. CJ Challenger is the new Midlands Area Super Welterweight Champion, after a pulsating, close points win over Kyle Haywood. The two men hardly took a backward step throughout in a close quarters fight. Challenger got the better of the first half of the fight, with the Beaumont Leys’ man getting the best of the frequent exchanges between them. Haywood began to come into the contest in the second half though, and connected with several eye catching attacks. In the end though, it looked as though Challenger’s early showing was enough for the nod, as referee Kevin Parker awarded him a tight 97-95 victory.